The pilot was conducting a local sightseeing flight at the time of the accident. A witness reported seeing the powered glider climbing out after takeoff and the engine "sounded perfect." He subsequently heard the sound of a "strained engine" similar to a propeller-driven airplane maneuvering during aerobatic flight. Shortly afterward, the sound of the engine stopped. A second witness observed the powered glider fly by with the engine running. It subsequently went out of sight below the tree line. Shortly afterward, he heard a loud noise that he initially attributed to work going on in the area. However, with thoughts of the low flying glider, he decided to drive to a nearby ridge where he observed the accident site. A postaccident examination and engine test run did not reveal any anomalies consistent with a preimpact failure or malfunction. Witness statements and satellite imagery indicated that building cumuliform clouds were present near the accident site. Weather radar data depicted a rain shower over the site about the time of the accident that appeared to be dissipating. With dissipating rain shower activity, the glider was in a favorable area for the existence of downdrafts. It is likely that the pilot encountered a downdraft that exceeded the maximum climb performance of the powered glider. 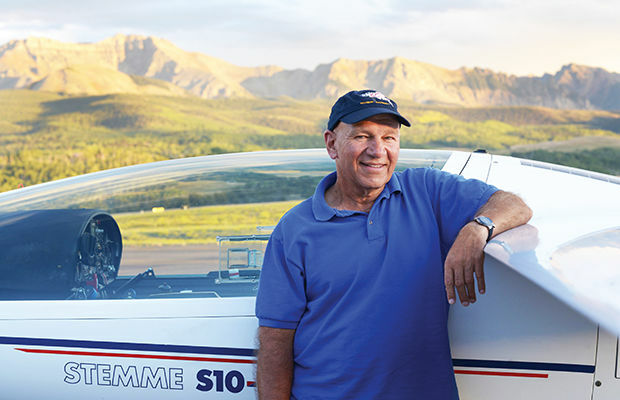 The pilot's encounter with a downdraft that exceeded the climb performance of the powered glider and resulted in his inability to maintain clearance from the trees. Contributing to the accident was the pilot's decision to fly near building clouds and rain shower activity. 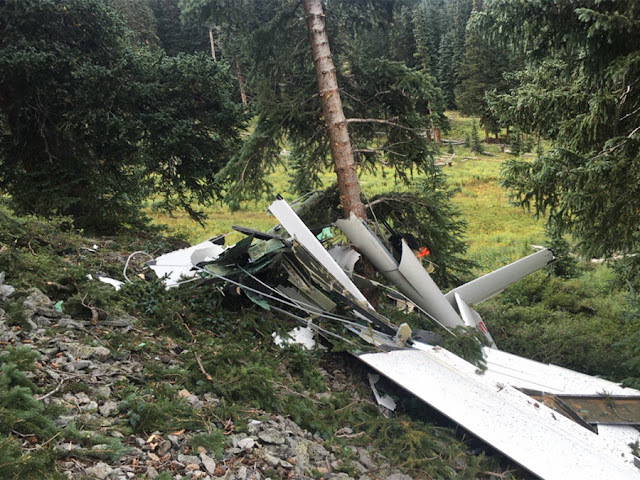 On August 24, 2016, about 1410 mountain daylight time, a Stemme Gmbh S10-VT self-launching (powered) glider, N5021, was substantially damaged during an in-flight collision with trees and terrain near Telluride, Colorado. The pilot and passenger sustained fatal injuries. The glider was registered to and operated by the pilot under the provisions of 14 Code of Federal Regulations Part 91 as a local sightseeing flight. Visual meteorological conditions prevailed for the flight, which was not operated on a flight plan. The flight originated from the Telluride Regional Airport (TEX), Telluride, Colorado, about 1315. A witness reported seeing the powered glider climbing out from TEX. The engine "sounded perfect" at a constant power setting at the time. About 15 minutes later, he heard the sound of a "strained engine." It sounded as if there was a "strain on the propeller," similar to a propeller-driven airplane maneuvering during aerobatic flight. About 15 seconds later, the sound of the engine stopped. He subsequently overheard radio communications of mountain staff personnel responding to a downed aircraft. A second witness observed the powered glider fly by with the engine running. His co-worker commented that the glider seemed to be flying unusually low. It subsequently went out of sight below the tree line. About 10 seconds later, they heard a loud noise, which they initially attributed to work going on in the area. However, with thoughts of the low flying glider, he decided to drive to a nearby ridge where he observed the accident site. He reported the accident to the local authorities. The pilot's logbook was not available to the NTSB and, as a result, his flight experience could not be determined. The pilot did not hold a current Federal Aviation Administration airman medical certificate, nor was one required to operate a glider. In February 1998, on his most recent application for a medical certificate, the pilot reported a total civilian flight time of more than 4,000 hours. No subsequent applications were on file. The pilot provided 30-minute and 1-hour sightseeing flights from TEX. Advertisement flyers were available at the TEX fixed based operator. The pilot maintained a website advertising the sightseeing flights. The pilot purchased the glider in July 2004. A review of the available maintenance records revealed that the most recent entry, dated September 20, 2012, was unsigned. The entry noted the completion of an annual inspection at airframe and engine total times of 1,824.2 hours and 496.3 hours, respectively. One witness reported light rain and steady surface wind about 8 mph from the northeast about the time of the accident. He stated that there was no thunderstorm activity in the immediate area; however, there was thunderstorm activity across the valley to the north and closer to the airport. Another witness reported that "dark rain clouds" began building near the site about 1 hour before the accident. Satellite imagery depicted growing cumuliform clouds near the accident site that were moving southeastward at the time. The cloud-top heights over the accident site were about 18,000 feet mean sea level (msl). Weather radar data depicted a rain shower over the site about the time of the accident. The rain shower activity was moving south-southeast and appeared to be dissipating. With dissipating rain shower activity directly above the site at the time of the accident, the glider was in a favorable region for downdrafts. No Significant Meteorological Information (SIGMET) advisories were in effect for the site at the time of the accident. An Airmen's Meteorological Information (AIRMET) advisory for mountain obscuration due to clouds and mist was in effect at the time of the accident. A full weather study is available in the docket for this accident case. The powered glider came to rest within a small cluster of trees about 5 miles south-southeast of KTEX at an elevation of 11,200 feet. The vicinity of the accident site consisted of mountainous terrain, densely wooded areas, and small meadows. The terrain gradually sloped downhill toward the north/northwest from the accident site. The elevations of ridgelines to the east and south of the site exceeded 12,500 feet. A postaccident examination and engine test run were conducted by the NTSB investigator-in-charge with the assistance of technical representatives from the airframe and engine manufacturers. The examination and engine run did not reveal any anomalies consistent with a preimpact failure or malfunction. The Montrose Memorial Hospital Division of Forensic Pathology, Montrose, Colorado, performed an autopsy under the order of the San Miguel County Coroner's Office, and attributed the pilot's death to multiple traumatic injuries sustained in the accident. Toxicology testing performed by the FAA's Bioaeronautical Sciences Research Laboratory, Oklahoma City, Oklahoma, was negative for all drugs in the testing profile. No carbon monoxide or ethanol was detected in blood specimens. On August 24, 2016, about 1410 mountain daylight time, a Stemme Gmbh S10-VT motor-glider, N5021, was substantially damaged during an in-flight collision with trees and terrain near Telluride, Colorado. The pilot and passenger sustained fatal injuries. The motor-glider was registered to and operated by the pilot under the provisions of 14 Code of Federal Regulations Part 91 as a local sightseeing flight. Visual meteorological conditions prevailed for the flight, which was not operated on a flight plan. The local flight originated from the Telluride Regional Airport (TEX), Telluride, Colorado, about 1315. A witness hiking between Mountain Village and the St. Sophia gondola station reported seeing the motor-glider under power apparently climbing out from TEX. The engine "sounded perfect" at a constant power setting at the time. About 15 minutes later, he heard the sound of a "strained engine" in the direction of Prospect Bowl. It sounded as if there was a "strain on the propeller," similar to a propeller-driven airplane maneuvering during aerobatic flight. About 15 seconds later, the sound of the engine stopped. He subsequently overheard radio communications of mountain staff personnel responding to a downed aircraft. A second witness working on the ski patrol shack at the top of the Revelation Lift observed the motor-glider fly by with the engine running. His co-worker commented that the glider seemed to be flying unusually low and it subsequently went out of sight below the tree line. About 10 seconds later, they heard a loud noise, which they initially attributed to other work going on in the area. However, with thoughts of the low flying glider, he decided to drive to a nearby ridge at which time he observed the accident site. He reported the accident to the local authorities. A third witness driving toward the Lynx building (near lift 13) in Prospect Basin (Bowl), looking directly at Gold Hill, reported observing the motor-glider low on the horizon just above the tree line. The aircraft proceeded south toward Prospect Ridge in what appeared to be a controlled descent. He subsequently lost sight of the aircraft behind a tree line. Although the motor-glider was at a "considerably" lower altitude than he was accustomed to seeing it, it did not appear to be out of control, nor did he perceive it to be in any distress. He and his co-worker subsequently received notification of the accident over their radio and responded to the site. The motor-glider came to rest within a small cluster of trees in the Prospect Bowl area of the Uncompahgre National Forest/Telluride Ski Area. 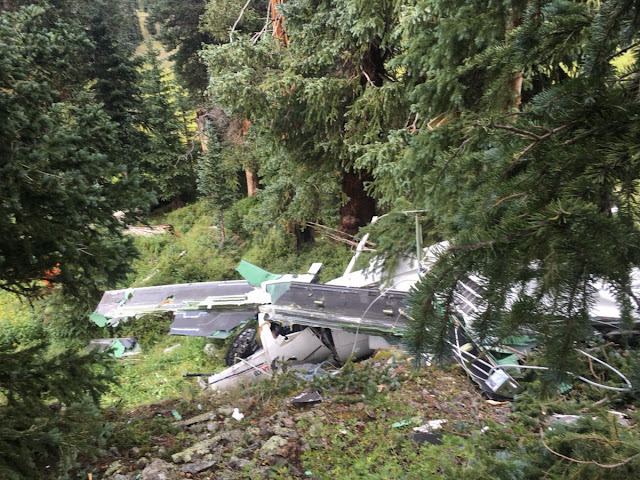 The accident site was located about 5 miles south-southeast of the Telluride airport at an elevation of approximately 11,200 feet. The vicinity of the accident site consisted of mountainous terrain; densely wooded areas, small meadows and exposed rock. The terrain gradually sloped downhill toward the north/northwest from the accident site. The ridgelines to the east and south of the site exceeded 12,500 feet. The forward fuselage was oriented on a northwest bearing. The fuselage nose and cockpit area sustained extensive damage. The aft fuselage was separated from, and located immediately adjacent to, the forward fuselage. The aft fuselage was oriented in the opposite direction from the forward fuselage. A tree was positioned between the forward and aft fuselage sections. The branches on the south/southeast side of the tree appeared to have been stripped of branches and bark from a height of about 20 feet above ground level. The southernmost tree in the cluster exhibited a fresh break located about 75 feet above ground level. The empennage, including the rudder and elevators, remained attached to the aft fuselage. Both wings had separated from the fuselage; they were located immediately adjacent to the fuselage at the time of the on-scene examination. However, local authorities advised that the right wing was initially located over the fuselage and was cut near the root in order to extricate the pilot. The left wing exhibited leading edge impact damage and deformation of the composite structure. The outboard section of the left wing, with the wingtip attached, had separated from the main wing and was located at the accident site. The left aileron was separated and fragmented; it was located at the accident site. The right wing, with exception of the damage at the root and separation of the wing tip, appeared to be intact. The right wingtip was located at the accident site. The right aileron remained attached to the wing. One of the witnesses reported light rain (sprinkles) and steady 5-8 mph surface winds out of the northeast about the time of the accident. He stated that there was no thunderstorm activity in the immediate area; however, there was thunderstorm activity across the Telluride valley to the north and closer to the airport. Another witness reported that the weather was initially sunny with some clouds and a calm wind. However, about 1300, the weather began to change, with "dark rain clouds" building above Prospect Basin (Bowl) and in the general Telluride vicinity. At 1415, weather conditions recorded at the Telluride airport included a calm wind, with thunderstorms and light rain showers in the vicinity. Detailed examinations of the airframe and engine are pending. A GPS Secure Flight Recorder (Cambridge Aero Instruments) was recovered at the accident site. Examination of the component and recovery of any retained data by the NTSB Recorders Laboratory is pending. Under the Maintenance Records - Seperate Entries ... Seem odd and not much detail ... Were these from the mechanics computer or was the owner falsifying mx entries? Curious.